African Stripes is an online string along with Judith Bertoglio-Giffin. 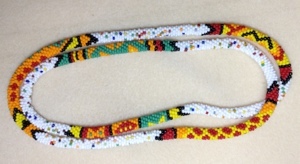 It is a pair of bead crochet ropes that are done in sections. Every week Judith would email us the next section. The ropes are named Mud Cloth and Love Letters. The first one we worked on was Mud Cloth which is a two color pattern. 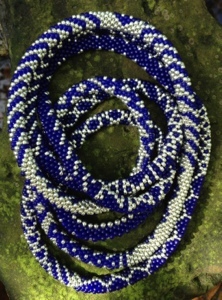 I chose cobalt and silver for my bead colors. Judith intended for us to swap the background and pattern colors halfway through the project. But, I loved my cobalt background and stuck with that. I made an additional 1/2 rope with the reverse colors. Love Letters was blocks of pattern with sections of white. 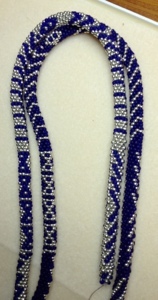 I wanted to break up the white and added a confetti of African Christmas beads. It worked out perfectly. 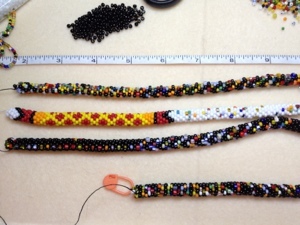 I was going to do an additional Mud Cloth rope using the Christmas beads and black beads. Unfortunately, that was a bust. You couldn’t see the pattern because the Christmas beads are too busy. I tried using them for the background and for the pattern. Neither worked for me. So, now I’m making a complementary rope with four inches of Christmas beads and a black band repeated until I get it to a length I’m happy with. Huge thanks to Judith for another successful string along. One of the best things about this project and other string alongs is the group ideas and feedback. Most of us are already bugging Judith for another one in 2013. Wow, those are all just stunning! I don’t crochet…I have too many fingers and thumbs apparently :-)…but those are just spectacular! Thank you, Lori! I appreciate the compliment and I appreciate that you took the time to read my blog.